The vote will be preceded by public hearing to allow comments and questions on the TIF request. WATERVILLE — The City Council on Tuesday will consider approving a tax increment financing district for Trafton Road Development and adopting a related development plan for the district. The meeting will be at 7 p.m. in the council chambers on the third floor of The Center at 93 Main St. downtown and will be preceded by a public hearing at 6:45 p.m. to discuss the TIF request. City Manager Michael Roy said Monday that two votes are needed to approve the TIF and related plan and only one vote may be taken Tuesday. “The concept of the district really is part of our obligation for when the Interstate 95 interchange was constructed,” Roy said. He said the city entered into an agreement with the state Department of Transportation and the developer, Trafton Properties, that the city would assist in reconstructing Trafton Road. “So the TIF allows us a source of funding to fund our share, which is limited to $500,000,” he said. Creating a TIF, he said, allows the city to capture new tax dollars for that area and fund its share of the cost. “I suspect the city will borrow $500,000 and use the TIF money to pay off our debt share for that borrowing,” Roy said. He said he expects the city would borrow the money next year. The goal of creating a TIF is to boost economic development, create jobs and help increase the tax base, according to Roy. “It’s all about economic development,” he said. The new $5 million Trafton Road interchange on Interstate 95 in the southern part of the city is drawing interest from companies seeking to add a Trafton Road delivery and shipping address. Funded by federal, state and private money, the full interchange at mile 124, which includes northbound and southbound on and off ramps, opened in mid-July. The DOT is planning to rebuild Trafton Road to accommodate the changes and increased traffic. 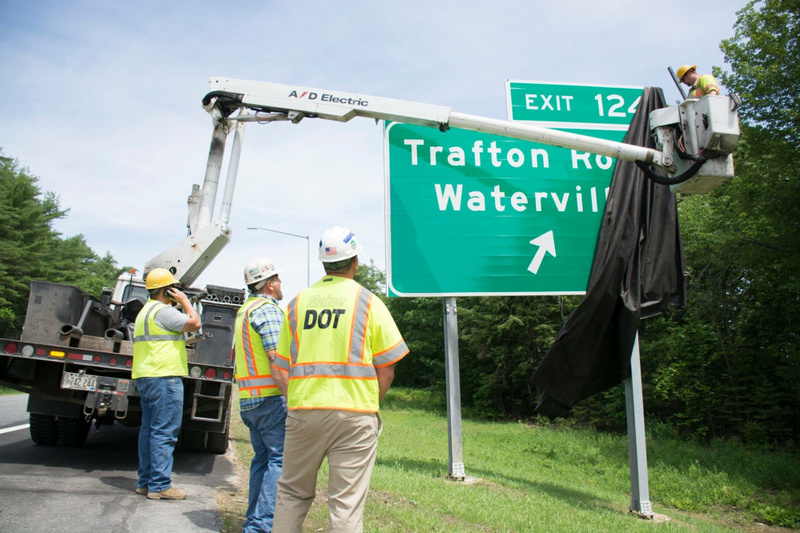 While statistics on the number of vehicles using Trafton Road and the interchange are not available, businesses, city officials and those who live in the area say that many more people are traveling Trafton Road to enter and exit I-95 at the interchange. People from Winslow who typically drive through Waterville and on Kennedy Memorial Drive to get to I-95 are now crossing Carter Memorial Bridge from Winslow into Waterville, crossing Abenaki Road and driving south on West River Road to get to Trafton Road. Garvan Donegan, senior economic development specialist for the Central Maine Growth Council, said last month that companies working in the areas of logistics and transportation, precision manufacturing, construction, marine technology and aquaculture, environmental services and energy are expressing interest in moving to the area where Trafton Properties, which provided major funding for the interchange, already has a building that is fully occupied with businesses at the corner of Trafton and West River roads. That 227,000-square-foot building is the former Wyandotte Mill. Trafton Properties, which owns 921 acres in Sidney and Waterville, received approval Aug. 7 from the city’s Planning Board to build next to the former mill a 120,000-square-foot commercial building to house new businesses. At the Planning Board meeting where the new commercial building was approved for Trafton Road, Christi Holmes, of Gorrill Palmer Consulting Engineers, of Gray, said the building would be constructed about a mile from the new I-95 interchange on a 75-acre site set back 150 feet from the southern abutter. The building’s owner anticipates having six tenants who might use the space for warehousing, storage and possibly light manufacturing, she said. The interchange project was funded by Trafton Properties, which pitched in $1.81 million plus engineering and other costs, a $1 million federal Economic Development Administration grant and $2 million from the state DOT. The idea from the start was to have the interchange take pressure off Kennedy Memorial Drive, which is congested with traffic, including trucks entering and exiting I-95. Before the Trafton Road interchange was built, trucks traveled north on West River Road past Thomas College and entered I-95 via Kennedy Memorial Drive more than 5 miles away. The interchange was the state’s first project under the Business Partnership Initiative, which gives road projects a higher priority if developers help pay for them. Geared toward projects that help local economic development efforts, it splits the project’s costs. Ernie Martin, senior project manager for the state Department of Transportation, said last month that the department is planning to rebuild Trafton Road so that it is built to standard, similar to the way Lyons Road in Sidney was rebuilt after an I-95 interchange was built there many years ago. Currently, travel lanes on Trafton Road are 10 feet wide. According to DOT’s current draft design, they would be widened to 11 feet with 4-foot paved shoulders, for a total of 30 feet of pavement, according to Martin. He said DOT has funding for the design phase of the project, Martin said, but does not yet have right-of-way or construction funding. While the road is city-owned, the state will take ownership within about a year, according to the city’s public works director, Mark Turner. In other matters Tuesday, councilors will consider taking the first of two votes needed to spend $4,300 from downtown TIF funds to prepare a detailed survey plan of the former Elden Inn property off Main Street so a public parking lot can be created there. The council also will consider the first of two votes needed to approve an environmental covenant to be developed with the state Department of Environmental Protection for two wastewater lagoons on West River Road. The covenant is designed to let people in the future know that the lagoon site contained contaminants from the former Wyandotte Mill across the road. Those contaminants included petroleum-based material and heavy metals from processing wool, according to Roy. The contaminants settled at the bottom of the two lagoons and the water in them was drained. Sediments were removed from one lagoon and placed in the other one and the lagoons were covered.